We Guarantee our work. If you are not satisfied with our performance please let us know right away – you must be happy or there will be no charge. Available to all PM Customers. We guarantee that all service calls made before 10:00AM will receive same day service! TRIAD offers SAME DAY Emergency Service. We understand how emergencies jeopardize cleaning schedules, and so we’ll take care of the problem today! Available to all PM Customers. Professionally Trained Cleaning Equipment Technicians – specialists in the maintenance and repair of you cleaning equipment. On-Location Service for Heavy Equipment – Manufacturer-trained technicians are equipped to make repairs at your facility or we pick up and deliver as needed. Computerized Report Detailing Service – With our complete service records at your fingertips, you have stronger asset management of your equipment. Safety Inspections – TRIAD’s thorough system-by-system inspections help assure machine safety and reduce employee and customer exposure to equipment-related hazards. 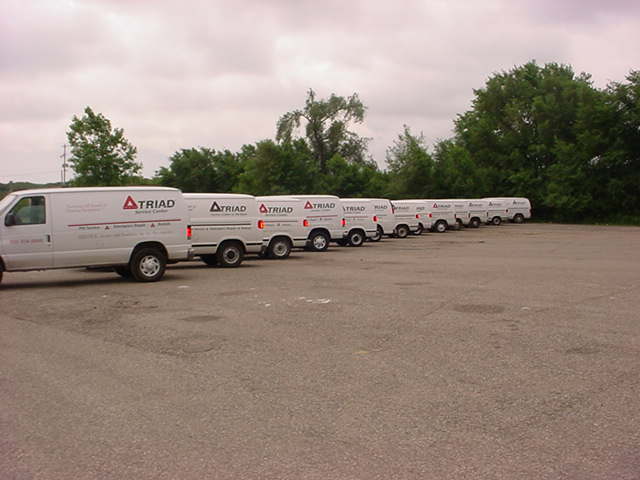 24-Hour On-Location Response Time – TRIAD gets your equipment up and running fast. Emergencies are taken care of today. Triad will inventory, photograph and assign equipment identification numbers to all equipment upon the initial visit and Scheduled Maintenance service. We will perform Scheduled Maintenance inspections of your battery and propane powered floor care equipment per the diagnostic checklists to assure that all daily & weekly maintenance is being performed. Scheduled Maintenance will be performed on the walk behind auto-scrubbers on a quarterly basis (12-week cycle) and the propane Burnishers are recommended on a 6-week cycle. Scheduled Maintenance will be based on a one-hour trip charge and then times required for performing all checks on the Scheduled Maintenance check sheets and replace all worn and damaged parts (time and material). Triad will record and track all service calls received in a call to service report that can be sent to customer contact(s). Triad will maintain a schedule for the Scheduled Maintenance Program and a complete service history of all equipment that is serviced. The service history is a database which keeps track of all service work performed on each piece of equipment. The service history can be queried by serial number, equipment identification number or customer number. This can be done in a matter of minutes, not days or weeks. Same day response to all calls for service received before 10:00 a.m. Triad will make every effort to complete calls received after 10:00 a.m. otherwise; calls received after 10:00 a.m. will be completed the following regular business day. Weekend and Holiday emergency service is available when necessary at overtime rates. Detailed service activity can be provided to Management upon request, at no additional charge. This report shows a complete breakdown of all service activities for a specific/designated period. The report will show all funds spent during the specified period. Service work orders will be completed and labor priced at the location at the time of the service. All parts will be listed but not priced. Triad technicians always emphasize safety first. Any machine that is unsafe to use will be rendered inoperable, if not repairable. All technicians are trained, professionally uniformed and fully insured. In the event that additional equipment is requested for use by management, a suitable rental machine can be provided. Upon receiving a completed credit application Triad will either approve or deny an account for credit. Triad accepts most credit cards as a method of payment. All accounts that are past due could result in service being denied. 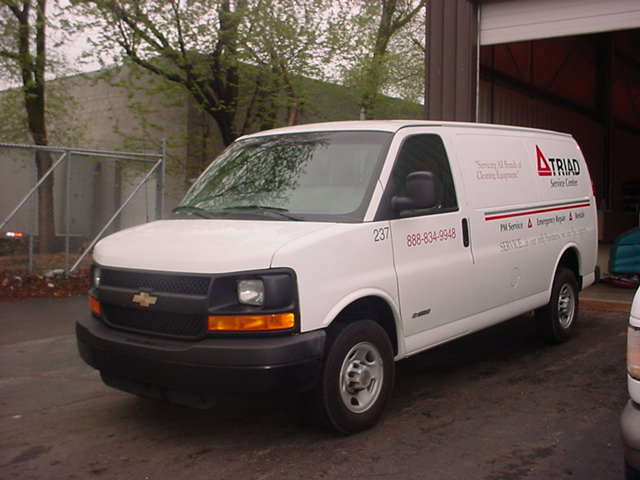 Triad does not require a formal contract to provide service, we are confident in our service capabilities. All labor will be billed in quarter hour increments. Satisfaction is guaranteed for all services provided. In order to ensure satisfaction, Triad requests that we become the exclusive service provider. All parts pricing will be based upon manufacturer’s suggested list price unless otherwise quoted. Rental equipment rates will be quoted before delivery and include delivery and pick up. We know the importance of having repairs made right the first time! That is why we have dedicated a large percentage of our resources towards having one of the largest parts inventories in the midwest, and even the country. This has helped us to increase our capability to complete repairs on the first trip. Our vans are stocked with parts based upon movement codes and the equipment used by our customers (partners). We are your PARTNER! Not just another vendor! We are an authorized warranty, parts, and service center for all value added items. Contact us today so we can help you reduce and control your cost.